Strawberries need at least 8 hours of full sun each day, and they prefer slightly acidicsoil with a pH between 5.5 and 6.8. 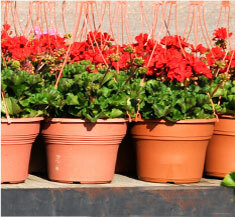 If soils in your area are naturally alkaline, it is best to grow strawberries in half-barrels or other large containers filled with potting soil. Strawberries may also sulk in heavy clay, which should be generously amended with Blessings Blends OMRI-Listed Premium Compost (.5 – .5 – .4), after mixing in 4 inches or more of compost, rake clay soil into raised mounds to further improve drainage. If your soil is sandy, simply cultivate to remove weeds, and mix in a 1-inch layer of rich compost. These young strawberry plants are sending out runners (the shoots to the left). You should clip most runners to allow the mother plant to produce more fruit. Strawberries eagerly produce offspring, so it is best to space them in rows 18 inches apart. Be sure to set the plants so that their roots are well covered with soil but the central growing bud (crown) is exposed to light and fresh air. This is very important; if you bury the crown, the plant could easily rot. Water them in well. 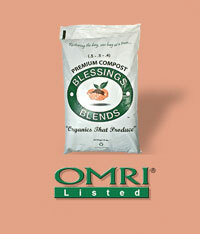 Blessings Blends OMRI-Listed Premium Compost (.5 – .5 – .4) for excellent results.Look for your plants to begin blooming in early spring, and the flowers must be visited by bees and other pollinating insects before they can set fruit. In warm, sunny weather, berries ripen about 30 days after blossoms are fertilized. An arch made of wire fencing can support a row cover for frost protection in the spring and bird netting later when the fruit comes along. Remove row covers when possible to encourage visits by bees that help with pollination.